Second Ferment: Wineau Abroad: Manns Wines ... by Kikkoman! Wineau Abroad: Manns Wines ... by Kikkoman! Big reveal time: I don't like sake. I've tried really hard to like it, I've sipped several different kinds, from earthy to sweet to bitter and every flavour profile in between. It just isn't my thing. So when Hubby went to Japan and said he would bring back some wine, I cringed. The closest I've ever come to "Japanese" table wine was with Oroya, which is actually made in Spain, so technically it doesn't count. (But the winemaker IS Japanese!) Little did I know that the local Japanese wine scene has slowly been evolving into something quite noteworthy. Wineries in several prefectures are adopting Western viticultural and winemaking processes, and are crafting quality products from 100-per-cent locally grown fruit. The scales are tipping in favour of shinshu (in Japanese, shin means 'true' and shu means 'essence') over international blends, imports and knock-offs. 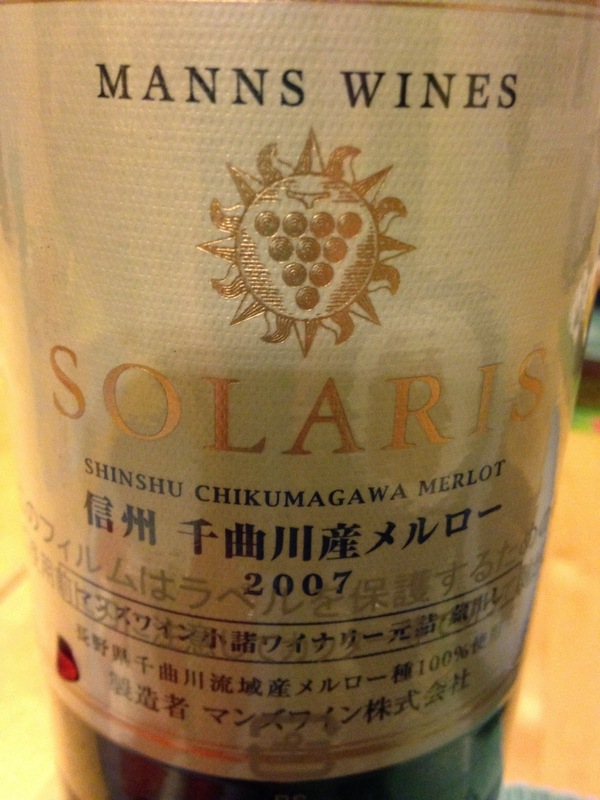 Solaris 2007 Shinshu Chikumagawa Merlot - Redolent nose of blackberry jam, licorice and plums, followed by a surprisingly dry palate and restrained flavours. Peppery, raisined, with a dusty, dry finish. Solaris 2010 Shinano Riesling Cryo-Extraction - Deep gold colour bordering on brownish-amber. Abundant aromas of apricot, canned pears in syrup, and honey. Ambrosial sweetness of stewed and dried fruits, with a hint of golden delicious apple. A spark of acidity on the finish gives it just enough edge to keep your pancreas from failing. Perfect for foie gras, stilton, poached pears or creme brûlée. Did You Know? Shinano riesling, I've discovered, is a proprietary cross between riesling and chardonnay that was created by Manns; judging by the medals on its website, I'd say it's doing quite well. So if Hubby makes a return trip, he may have to bring along an extra suitcase. soy sauce, but some pretty decent wine, too!